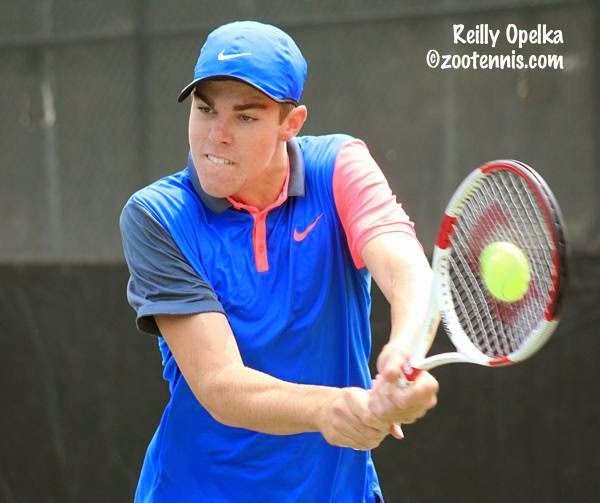 Deiton Baughman is 976 in the ATP rankings, Logan Smith is 43 in the ITF world junior rankings and Reilly Opelka is 6 in the USTA 18s rankings, but all found themselves in the newly introduced qualifying tournament at Kalamazoo. All three won two matches today at Stowe Stadium to advance to Friday morning's final round of qualifying, but only two were seeing their early start as a glass half-full. "I just look at as a positive thing, getting match play in before the main draw," said Smith, who defeated Felipe P. Osses-Konig 7-6(2), 6-0 and Nathan Griffin 6-1, 6-1. "I was a little nervous in my first round match this morning, but after the first set I was pretty confident, playing exceptionally well. So I just look at it as a positive thing." Smith, the No. 3 seed in qualifying, applied for a wild card, but even though he didn't receive one, he understood why. 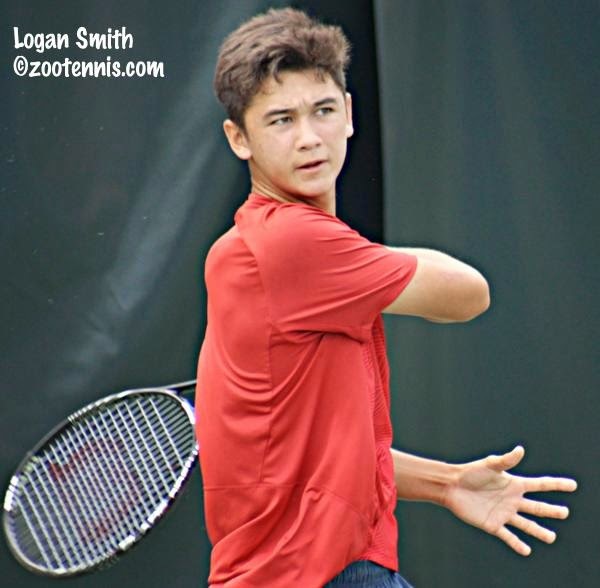 "I though the wild cards were pretty fair--half ATP, half ITF," said the 17-year-old Smith, who plays unseeded Fred Mesmer in the final round Friday. "If you want to win the tournament, you have to beat everybody." The top-seeded Baughman, who defeated Anthony Arocho 6-1, 6-2 and Jonathan Li 6-2, 6-1, also admitted to some nerves in his final appearance in Kalamazoo. "I came out a little tight this morning, but this afternoon I played pretty well, dialed in the entire time," said the 18-year-old from Carson, California. Baughman said he was disappointed when he first learned he would not be granted a wild card, but didn't dwell on it. "You'd think being top 1000, with the number of Futures I've played this year, I've done pretty well in singles and doubles," said Baughman, who plays No. 11 seed Nathan Brown in the final round of qualifying. "I thought maybe a little seniority might slide me into the main draw. But I look at it as a blessing in disguise. I get three extra matches and can get comfortable here, on the main court especially, and just take it round by round." Opelka, the No. 2 seed, was not convinced that the benefits outweighed the drawbacks of competing in the qualifying. "There's no plus side to being in qualies," said the 6-foot-9 Opelka, who beat Caleb Troy 6-2, 6-4 and Gianni Mancini 7-5, 6-3. "I don't mind it, but I don't see a plus side. Yeah, maybe you get used to the conditions, but by the time you play your first round you've already played three matches." Opelka had no complaints about those who received wild cards. "The guys they gave them to deserved it over anyone else," said the 16-year-old from Florida, who plays unseeded Jayanth Chintham in the final round Friday morning. "All of them had the same problem as me--I mean Collin Altamirano had to get a wild card. I'm sure they'll fix it for next year." A total of seven seeds reached the final round of qualifying in the 18s, while nine seeds won both their qualifying matches Thursday in the 16s, including No. 1 seed Jackson Suh, No. 2 seed Brian Cernoch and No. 3 seed Sebastian Arcila. For complete results from today's first two rounds, see the TennisLink site. Singles draws will be posted, as will the doubles draws, on Friday. 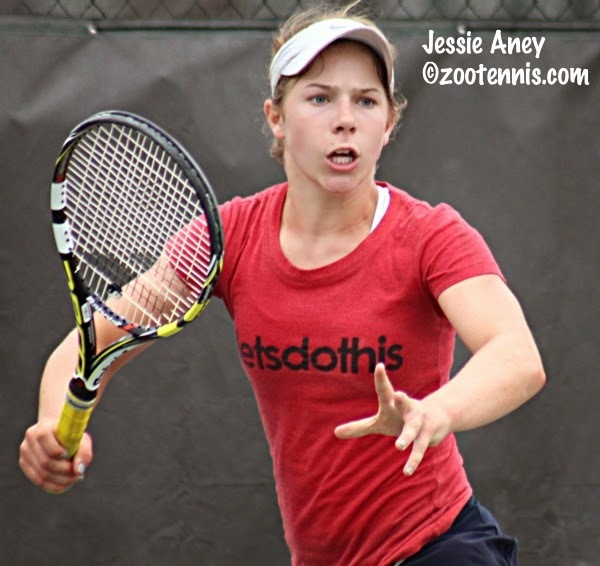 I mentioned in yesterday's post that Peggy Porter had been overlooked in seeding and was scheduled to play top seed Louisa Chirico in the second round at the Girls 18s Nationals in San Diego. Today, that error was rectified, with Porter given the No. 6 seed and now in the bottom half of the draw. Ellie Halbauer was dropped from the No. 16 seed to a No. 17 seed, and Olivia Sneed went from a 17 seed to unseeded. The corrected draw, as well as the qualifying results, are at the TennisLink site. I had to look through the entries myself, to investigate a nagging suspicion I had, and sure enough, once I got to the "Ps," I saw it. Peggy Porter is not seeded. Porter, who will be 19 in November, is 525 in the WTA rankings, higher than Katerina Stewart, Brooke Austin and Ellie Halbauer, all of whom are seeded. Stewart has continued to play junior tournaments, but both Austin and Halbauer have, like Porter, opted out of junior competition this year. These oversights are not always fatal, depending on the draw, but this one could prove to be, as Porter is slated to meet top seed Louisa Chirico in the second round. That will be a must-see match for spectators, but it's not good for either player, or the tournament. 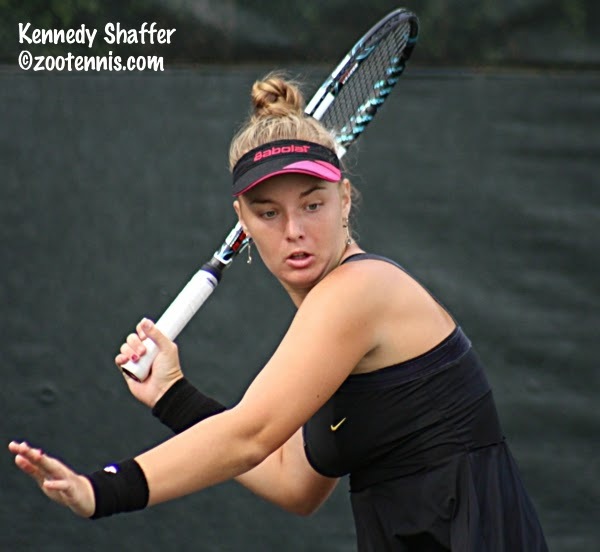 That nagging feeling of someone missing also could have been centered on Clay Court finalist Kennedy Shaffer, but she wasn't overlooked for seeding. Rather, she is not in the field, although she was intending to play when I last spoke to her in Memphis. There are some tough unseeded players in the 16s, including Dominique Schaefer, Alexa Graham, Ashley Lahey, Ndindi Ndunda, Jada Hart and Abigail Desiatnikov. Last year's National 18s champion Sachia Vickery is having the best week of her career at the WTA Bank of the West Classic at Stanford. Vickery, who qualified over the weekend, defeated Monica Puig 6-7(4), 6-2, 6-1 today to reach the quarterfinals. The 19-year-old from Florida will play fellow American Varvara Lepchenko, who upset No. 2 seed Agnieszka Radwanska of Poland this afternoon 6-3, 3-6, 6-4, for a place in the semifinals. 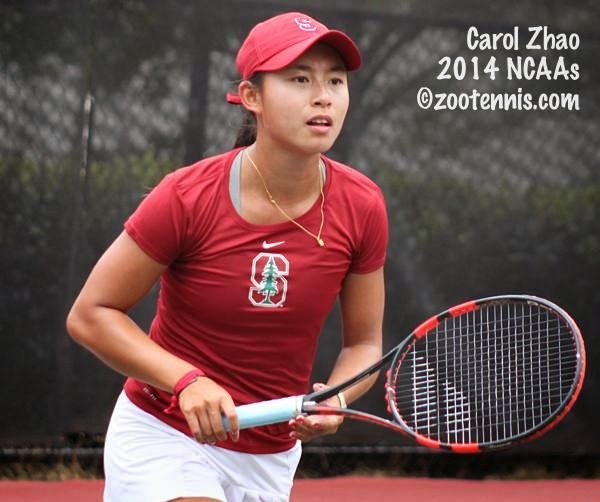 Stanford rising sophomore Carol Zhao takes on No. 5 seed Anna Ivanovic of Serbia in their second round match Thursday. The finals of the USTA Boys 18s National Team Championships were today at the University of Illinois, with the No. 2 seed Midwest section team defending its title with a 6-1 win over top seed Southern (note: correction made, initially shown as 5-2 final score on TennisLink). Because results are difficult to find on the TennisLink site, I'm including a screenshot of today's results. The girls final is also between Southern and Midwest, but the results will not be available until much later, because it is being played in Claremont California. The TennisLink site is here. Because for most of the next six weeks I will be reporting almost entirely on the tennis matches I am watching each day at the tournaments I am covering, this is a good day to post a series of quick links on items of interest I'm not going to have time to delve into. Southern California won the USTA Intersectional Team competition for 16s earlier this month, beating Midwest 6-3. For more on the final, see this article from the Shreveport Times. I was in Europe when the last of the US Open National Playoff tournaments finished and wasn't able to post on the final five sectional champions. Articles on those tournaments can be found here. A screenshot of all the winners is below. Daniel Coyle, author of The Talent Code: Greatness Isn't Born. It's Grown. Here's How, has written this article about reconciling the nature/nurture "impasse" that always surrounds any discussion of developing skills. The REPS gauge is certainly a feature any tennis coach or parent should consider. Josh Rosen, who is now one of the top high school quarterbacks in the country, was a tennis player before he chose to concentrate on football full time. As much as he appreciates his current sport, he says tennis is the sport that produces the best athletes in this article from USA Today. Clay Thompson, the recent UCLA graduate and former No. 1 player in the country, will play with OTZ Sports' new EcoGrip and its vibration dampener. OTZ is a longtime sponsor of ZooTennis. More on Thompson's agreement with OTZ can be found here. 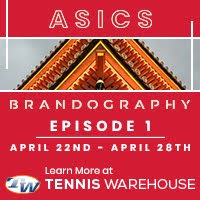 There is a new tennis academy in the Orlando, Florida area, with former Winthrop University coach Andrew Stubbs and former Top 25 ATP pro Tim Wilkinson serving as managing director and director of coaching respectively. For more on the Bishops Gate Academy, see the website. Rising Stanford sophomore Carol Zhao, who qualified over the weekend for the WTA Bank of the West Classic held on the campus where she attends classes, won her first round match when Yanina Wickmayer of Belgium retired trailing 6-2, 1-0. It is Zhao's first win in a WTA main draw. For more, see the Stanford website. 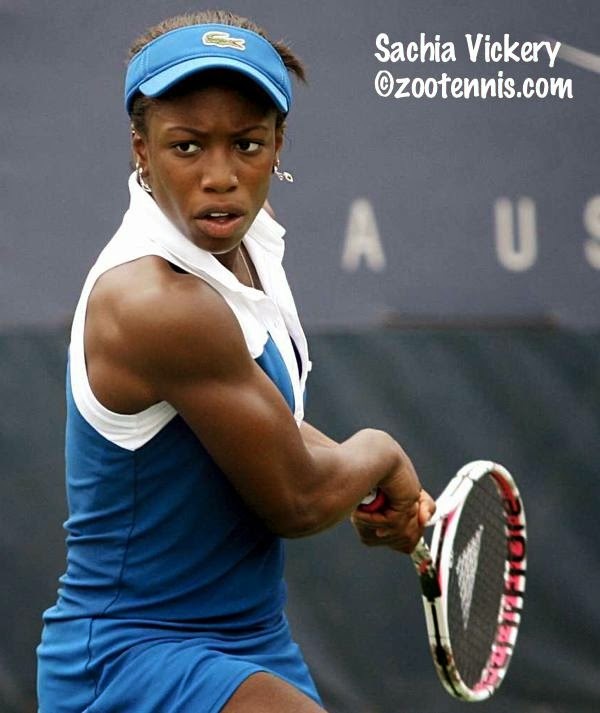 Sachia Vickery, the 2013 18s USTA national champion picked up her second WTA main draw win yesterday. The 19-year-old from Florida, who won a round as a wild card at the US Open, defeated Shuai Zhang of China, the WTA's 30th ranked player, 6-1, 6-2. She will play her second round match against Monica Puig of Puerto Rico, who upset No. 7 seed Carla Suarez Navarro of Spain 6-3, 7-5 today. Francis Tiafoe's ATP debut produced several articles on his prospects for professional success. Steve Tignor of tennis.com wrote this piece after watching the match on the Tennis Channel. Jeff Sackmann of the Heavy Topspin blog was in Washington DC, and he wrote this assessment. As someone who's seen Tiafoe play scores of tennis matches, it's interesting to get the perspective of someone watching him for the first time, but it's important to remember--and I'm sure both writers realize this fact--that one match is a very small sample size on which to base a considered opinion. The University of Texas has still not found a permanent replacement for Patty Fendick-McCain, who retired as the Longhorns' women's head coach in June. Fendick-McCain's assistant Darija Klaic has been named interim head coach while the search continues. The qualifying draws, the first in the Kalamazoo tournament's 72-year history, have been posted at the TennisLink site. The 64-player draws in both the 16s and 18s divisions will produce eight qualifiers. Two rounds of qualifying are scheduled for Thursday, with the final round of qualifying on Friday morning. Deiton Baughman, Reilly Opelka and Logan Smith are the top 3 seeds in the 18s qualifying. Eduardo Nava was the No. 4 seed, but he has already withdrawn and is playing in the main draw at the Decatur Futures this week. Jackson Suh, Brian Cernoch, Sebastian Arcila and Conrad Russell are the top four seeds in the 16s qualifying. The qualifying draws for the Girls 16s and 18s have not yet been released. Fred Sidhu, the media liaison for the tournament, reported today that wild card Christina Makarova has withdrawn due to injury. While the USTA is gearing up for its National Championships, Tennis Europe just finished its edition, which includes 14s, 16s and 18s--the latter an ITF Grade B1 event. No. 2 seed Quentin Halys of France, a finalist in 2013, took the title this year, defeating unseeded compatriot Corentin Denolly 6-4, 7-5 in the finals, which were moved indoors due to rain in Switzerland. Unseeded Sara Sorribes Tormo of Spain, who won the 16s title in 2012, also beat a competitor from her own country, defeating No. 5 seed Paula Badosa Gibert 6-4, 6-1, with that final also played indoors. Complete results from the tournament can be found at the ITF Junior website, and an article about the 18s finals is available at the Tennis Europe site. In the 16s, No. 2 seed Fanny Stollar of Hungary and No. 3 seed Corentin Moutet of France took the titles. Stollar beat No. 5 seed Anna Blinkova of Russia 6-4, 6-0 in the final, and Moutet outlasted Mikael Ymer of Sweden, the No. 7 seed, 6-7(2), 6-1, 6-0. For more on the 16s competition in Moscow, see this Tennis Europe article. Rudolf Molleker of Germany and Anastasia Potapova of Russia won the 14s titles in the Czech Republic, with Molleker, the No. 2 seed, defeating No. 3 seed Tomas Jirousek of the host country 6-0, 6-1 and No. 3 seed Potapova downing top seed Olesya Pervushina, also of Russia 6-1, 2-6, 6-2. According to this article on the 14s finals from Tennis Europe, all four finalists will be playing in the ITF's 14-and-under World Junior Tennis competition in the Czech Republic next month. Although I have not yet seen the team nominations, the ITF did post the list of countries who make up the 16-team fields. The United States will send both girls and boys teams to compete in the August 4-9, with the US girls the reigning world champions. The boys leaving for Europe on Thursday, after a training session in Boca Raton, are Keenan Mayo, Roscoe Bellamy and Steven Sun. The girls team this year consists of Claire Liu, Elysia Bolton and Rachel Lim. Seeds have not yet been established, with that and the draw scheduled for Sunday August 3rd. Two of the boys who will be among the favorites for the Kalamazoo title played the first ATP main draw matches of their careers tonight at the Citi Open in Washington DC, with both Francis Tiafoe and Jared Donaldson losing their debuts. Donaldson lost to fellow qualifier Rajeev Ram 6-7(1), 6-4, 7-5 and wild card Tiafoe went down to Evgeny Donskoy of Russia 6-4, 6-4 in a match televised on Tennis Channel. Ranking 111, Donskoy never looked in serious danger of losing to the 16-year-old from nearby College Park, Md., but Tiafoe did show flashes of the game that has drawn so much attention since he won the Orange Bowl last December. Qualifier Taylor Townsend won her first round match over Julia Goeges of Germany 3-6, 6-2, 6-3, and Shelby Rogers upset No. 3 seed Alize Cornet of France 7-5, 4-6, 6-4 in Washington, but the real story of the day came out west, where 16-year-old qualifier Naomi Osaka of Japan, ranked 406, beat No. 19 Samantha Stosur of Australia 4-6, 7-6(7), 7-5 in the first round of the Bank of West Classic. Osaka, who I believe is based in Florida, does not play junior events, but she has won enough on the ITF Women's circuit to be ranked as high as 309 in May. For more on Osaka's win, see the WTA website. Fifteen-year-old Kelly Chen went straight from the G18s Clay Courts in Memphis to the qualifying tournament of the $10,000 Pro Circuit event in Austin. Before she made that trip, Chen had only one main draw victory in a professional-level tournament, but this week she got five, beating 2013 NCAA finalist Mary Weatherholt 6-3, 7-6(7) in Sunday's final. 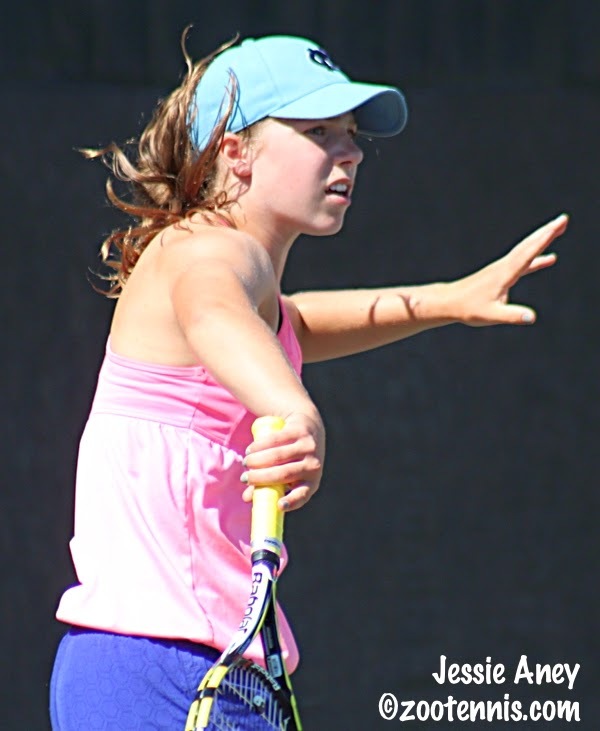 The Cerritos, California resident, who works with former NCAA champion and WTA Top 40 player Debbie Graham, now heads back home to compete in the Girls 18s National Championships, with the main draw in that division beginning next Sunday. At the men's $10,000 Futures in Godfrey, Illinois, Daniel Nguyen posted his second straight win over Mitchell Frank, this time in a final, defeating the Cavalier rising senior 3-6, 6-2, 7-6(2). Frank served for the match at 5-3 in the third, but Nguyen rebounded and after trailing 2-0 in the tiebreaker, captured the finals seven points for his first title of 2014. The former USC Trojan, who completed his eligibility in 2012, has won four Futures singles titles in his professional career. Nguyen wasn't the only Trojan having a good week on the professional tour. Steve Johnson reached the BB&T Atlanta Open doubles final with Sam Querrey, losing to Wimbledon champions Jack Sock and Vasek Pospisil 6-3, 5-7, 10-5 today. Rising senior Roberto Quiroz of Ecuador swept the titles at this week's $15,000 Futures in Venezuela. The No. 7 seed, Quiroz downed former Duke star Henrique Cunha, seeded third, 6-4, 6-4 in the semifinals and defeated No. 8 seed Jorge Panta of Peru 6-3, 6-4 in the final for his first ITF Men's circuit singles title. He and Mateo Martinez of Argentina were the top seeds in doubles, and they claimed the title when their opponents retired trailing 6-4, 1-1. Quiroz now has 10 Futures doubles titles. Nicole Gibbs lost in the final of the $50,000 Lexington Challenger to Madison Brengle today 6-3, 6-4, but the two-time NCAA champion while at Stanford secured her third straight US Open wild card by just reaching the final, after winning the $50,000 tournament in Carson last week. The only player who could catch her was Melanie Oudin, whom she beat in the final last week, and when Brengle beat Oudin, this time in the semifinals, Brengle couldn't match Gibbs' point total. Here is the usta.com article on Gibbs' US Open Wild Card Challenge win. 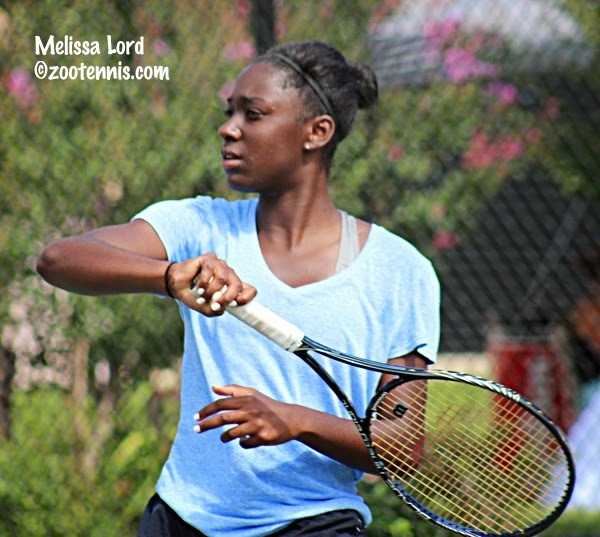 In the final round of qualifying at the Citi Open, Jared Donaldson, Tornado Alicia Black and Taylor Townsend all advanced to the main draw with straight-set wins. Donaldson defeated Sekou Bangoura Jr. 6-3, 6-1 and will face fellow qualifier Rajeev Ram in the first round Monday evening. Also on Monday, on the stadium court, televised by the Tennis Channel at 8 p.m., 16-year-old Francis Tiafoe makes his main draw ATP debut against Evgeny Donskoy of Russia. Monday's complete order of play is here. Black and Townsend are also on Monday's schedule, with Black defeating Great Britain's Emily Webley-Smith 6-3, 6-0 in today's final round of qualifying, and Townsend downing top seed Tereza Smitkova of the Czech Republic 6-3, 6-4. Black meets Zarina Diyas of Kazakhstan and Townsend plays Julia Goerges of Germany with both matches Monday night, but not on the stadium court. Out at the WTA's Bank of the West Classic, rising Stanford sophomore Carol Zhao of Canada earned her way into the main draw, beating Marina Shamayko of Russia 6-1, 1-6, 6-4 in today's second, and final, round of qualifying. She will play Yanina Wickmayer of Belgium Tuesday in the first round. Recent Stanford graduate Kristie Ahn meets CoCo Vandeweghe Monday night. For more on Zhao and Ahn, see this article from the Stanford website. Sachia Vickery also advanced to the main draw, with a 6-4, 6-1 upset of top qualifying seed Aleksandra Wozniak of Canada, 103 in the WTA rankings. The 2013 USTA National 18s champion will play Shuai Zhang of China in just her second WTA main draw appearance (not including her appearance in this year's Australian Open after winning the USTA wild card tournament, and her wild card into last year's US Open as junior champion, where she won a round). The US Open Series is underway with the ATP's BB&T Atlanta Open kicking off the five-week lead-in into the US Open. Defending champion and top seed John Isner is in the final for the fourth time in five years after his 7-5, 6-4 win today over Jack Sock. He will play either Germany's Benjamin Becker(Baylor) or Dudi Sela of Israel in Sunday's final. Steve Johnson(USC) and Sam Querrey have reached the doubles final. 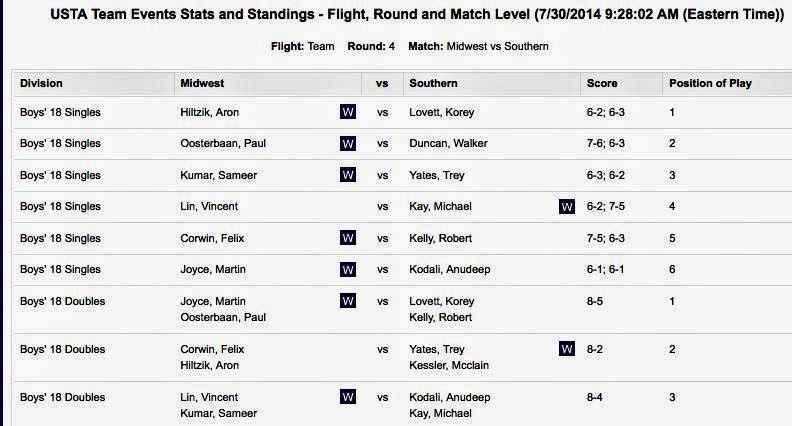 There are three US Open series events on the schedule for next week. The ATP has a 500-level in Washington DC, with the women sharing the courts in an International level event. On the west coast, the women's premier event is the Bank of the West Classic, held on the Stanford campus. It was announced on Friday that 16-year-old Francis Tiafoe, who trains at the Junior Tennis Champions Center in nearby College Park, Maryland, had received a main draw wild card into the Citi Open in Washington DC, where he'll face Evgeny Donskoy of Russia in the opening round. The ITF's 2012 World Junior champion Filip Peliwo of Canada also received a main draw wild card, as did top seed Tomas Berdych and James Duckworth of Australia. The men's qualifying draw contained plenty of players with local connections including, Justin and Ryan Shane, Michael Shabaz and Sanam Singh, all current or former University of Virginia players. They all fell in the first round today, but Jordi Arconada, who trains at the JTCC and lost in the final of a prequalifying tournament to Tiafoe, had better luck. When Tiafoe got the main draw wild card, Arconada was given the qualifying wild card, and is now in the second round. Up a break 3-2 in the first set, Arconada got the win when French veteran Michael Llodra retired. Wimbledon boys finalist Stefan Kozlov was two points away from an upset of top qualifying seed Sam Groth of Australia up 6-3 and at 5-5 in the second set tiebreaker, but Groth came back for a 3-6, 7-6(5), 6-4 victory. 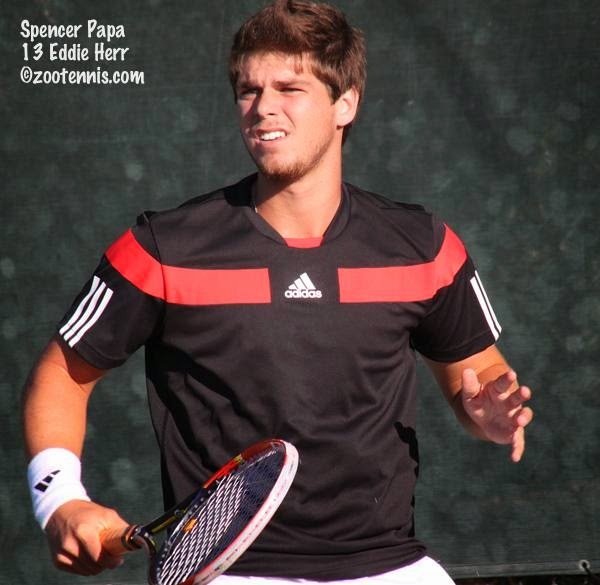 Jared Donaldson, last year's Kalamazoo finalist and most likely to be the top seed there next week, cruised past No. 10 seed Gonzalo Lama of Chile 6-1, 6-1 and will play former Florida Gator Sekou Bangoura for a spot in the main draw. Former USC Trojan Emilio Gomez also advanced to the final round of qualifying. 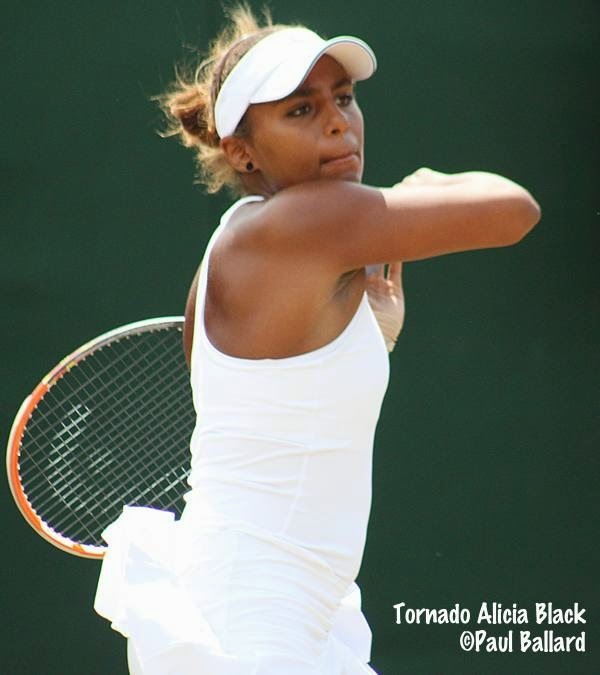 In the WTA Citi Open qualifying, Tornado Alicia Black defeated Louisa Chirico 6-3, 6-1 and will face Great Britain's Emily Webley-Smith in Sunday's final round of qualifying. Taylor Townsend also advanced to the final round of qualifying, with the No. 5 seed set to face top seed Tereza Smitkova of the Czech Republic, who reached the fourth round at Wimbledon this year. The Tennis East Coast blog is onsite covering the Citi Open and has posted articles and photos from today's qualifying action. At the Bank of the West Classic, Kristie Ahn, who played No. 1 for Stanford this past year as a senior, received a main draw wild card and will face CoCo Vandeweghe in the first round. 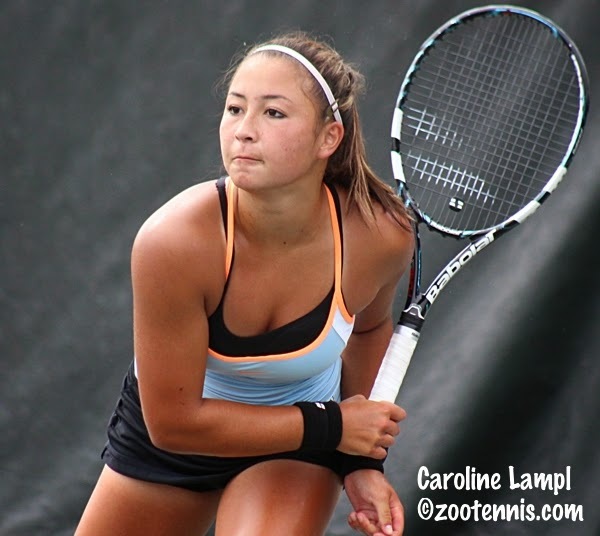 Qualifying wild cards went to two current Cardinal rising sophomores--Caroline Doyle, who lost to top seed Aleksandra Wozniak of Canada 7-5, 6-3, and Canadian Carol Zhao, who surprised fellow teenager and No. 2 seed Katerina Siniakova (WTA 123) of the Czech Republic 7-5, 4-6, 7-6(3) in the day's final match in Palo Alto. Wimbledon girls quarterfinalist Michaela Gordon, who turned 15 today, received an early birthday present in the form of a qualifying wild card, but she fell to Sachia Vickery, the No. 6 seed, 6-4, 6-1. Doubles star Raquel Kops-Jones, a former Cal standout, received a wild card and surprised No. 3 seed Mirjana Lucic-Baroni of Croatia 6-2, 7-6(8). At the two Pro Circuit Futures events this week, all four finalists are from the United States, assuring another American sweep, just as last week. University of Virginia rising senior Mitchell Frank, who won the $10,000 Futures last week in Tulsa, goes for his second straight title in Godfrey Illinois Futures, where he'll meet former USC Trojan Daniel Nguyen. The unseeded Frank defeated North Carolina rising sophomore Ronnie Schneider 6-0, 7-5 in the semifinals today, while No. 8 seed Nguyen downed No. 4 seed Luke Bambridge of Great Britain 4-6, 6-4, 6-4. Nguyen lost to Frank twice in college, when he was a senior and Frank a freshman, falling in the semifinals of the ITA All-American Championships in 2011 and in the NCAA team final in 2012. But Last month in the Buffalo Futures quarterfinals on clay, Nguyen beat Frank 7-5, 6-1. Bambridge and Liam Broady, the top seeds, defeated unseeded Schneider and teammate Brett Clark 6-3, 6-2 in the doubles final. 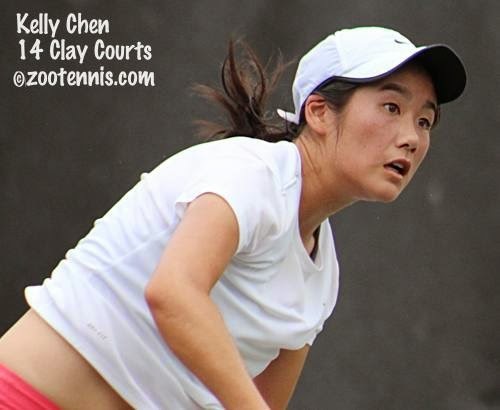 At the $10,000 women's tournament in Austin, Texas,, qualifier Kelly Chen, a quarterfinalist last week at the Clay Courts, has reached her first Pro Circuit final with a 7-6(5), 6-2 win over Usue Arconada, Chen's first straight-set win of the week. Arconada, by the way, had earned a wild card into the Citi Open qualifying in the JTCC's prequalifying tournament, but because she is playing in an international junior team tournament at Wimbledon next week, she was unable to accept it. Chen will play 2013 NCAA finalist Mary Weatherholt(Nebraska), who is just returning to competition this summer after recovering from yet another serious knee injury. Weatherholt defeated No. 5 seed Nives Baric of Australian 6-4, 6-1 to reach her first singles final. She has first title already however, and she and Catherine Harrison of UCLA won the doubles championship, beating Alexa Guarachi (Alabama) and Alex Cercone (Florida) 6-2, 7-5. Peter Kobelt and Devin McCarthy (Ohio State) won their fourth Futures doubles title since the first of June at this week's Hong Kong Futures. Kobelt and McCarthy have reached the final of all six Futures they've played together this summer. In less than a week, qualifying for the Boys and Girls 16s and 18s National Championships will begin, but before we start anticipating that, it's time to take a final look back at last week's USTA Clay Court championships. My review of the Girls 18s in Memphis is up this afternoon on the Tennis Recruiting Network, but make sure you read all eight articles on one of the three individual gold ball events remaining in the USTA junior tournament structure. Links to all eight articles can be found at the bottom of my recap at TR Net. A slideshow of the top performers in Memphis and videos of finalists Katerina Stewart and Kennedy Shaffer are below. The first annual New Balance High School Tennis Championships were completed today in Cambridge, Mass, with No. 2 seeds in both the boys and girls draws winning the title. Madison Clarke, a rising senior from Phoenix, won the girls championship, defeating No. 5 seed Jenna Moustafa of Los Angeles, a rising sophomore, 4-6, 6-2, 6-1 in the final. The boys final was also a three-setters, with Matt Kuhar of Rhode Island, who will be competing for Bryant University this fall, defeating No. 7 seed Maxwell Cancilla, a rising junior from Huntington Beach, Calif., 7-5, 4-6, 6-3. For complete draws, see the TennisLink site. Another week, another 17-year-old making waves on the ATP Tour. 2013 US Open boys champion Borna Coric of Croatia received a wild card into Umag, in his home country, and he has beaten tour veterans Edouard Roger Vasselin of France, the No. 7 seed, and Horacio Zeballos of Argentina, to advance to the quarterfinals. He will play top seed Fabio Fognini of Italy next. Teenagers at the Austin, Texas $10,000 tournament for women and the Godfrey, Illinois $10,000 tournament for men, also had a good day. Eighteen-year-old Spencer Papa, who had beaten No. 3 seed and current Wimbledon boys champion Noah Rubin in the first round, defeated TCU's Nick Chappell 6-3, 3-6, 6-3 to advance to the quarterfinals. Papa, who starts at Tulsa this fall, had advanced to the final of a Futures in Mexico earlier this month, and reached the quarterfinals at last week's Futures tournament on his future campus. One of the unfortunate results of the current entry system for the Nationals is that Papa, who will not be 19 until October, was unable to get a wild card into Kalamazoo, with all eight going to other (deserving) players. Certainly setting aside four wild cards for qualifying should be considered when suggestions for improving the new system are solicited. Papa is one of five Americans in the quarterfinals, with UNC's Ronnie Schneider, Virginia's Mitchell Frank and former collegians Daniel Nguyen(USC) and Jeff Dadamo(Texas A&M) the others. In Austin, 15-year-olds Usue Arconada and Kelly Chen are through to the quarterfinals, with Chen going directly from the Clay Courts in Memphis to the qualifying in Austin. Arconada and Chen are joined in the quarterfinals by three former US collegians: Alex Guarachi of Alabama (last week's Vancouver $10K winner), 2013 NCAA finalist Mary Weatherholt (Nebraska), who play each other in a rematch of the 2013 NCAA semifinals, won 6-0, 6-3 by Weatherholt, and recent Florida graduate Alex Cercone of Florida, who faces Chen. At the $50,000 Lexington Challenger, two-time NCAA champion Nicole Gibbs kept her hopes for a third straight US Open wild card alive, saving a match point in her 3-6, 7-6(7), 6-2 win over UCLA rising sophomore Jennifer Brady. Gibbs, Oudin and Brengle, all into the quarterfinals, still have an opportunity to win the USTA's Wild Card Challenge. At the men's $50,000 Challenger in Lexington, Chase Buchanan(Ohio State) and Wayne Odesnik are the sole Americans still in the singles draw. For those waiting for a release from the University of Virginia on Andres Pedroso's decision to leave his position as men's assistant, it's here. The acceptance lists for the US Open Junior Championships are out. fIn the boys draw, not only are the top three boys in the ITF junior rankings entered, but several of the best young players who haven't been competing regularly on the ITF junior circuit, but rather in the lower levels of the professional tour. Elias Ymer of Sweden, whose current ATP ranking of 286 will have him seeded third in the US Open Juniors should he keep that top 350 ATP ranking, has entered, as has Italy's Gianluigi Quinzi (ATP ranking 312, also assuring a top 4 seed in USO Juniors), and Jared Donaldson of the US (ATP ranking 333, which, in the ITF's current seeding protocol, will put him in the top 4 too). Wimbledon boys champion Noah Rubin, with his ATP ranking of 537, also received direct entry to the main draw. There is no guarantee all four will play, of course, with withdrawals permitted up to August 19th. In addition to the four players above, world No. 1 Andrey Rublev of Russia, the French boys champion, No. 2 Stefan Kozlov, a finalist at the Australian Open and Wimbledon this year, and No. 3 Orlando Luz of Brazil are also entered. In fact, only six of the top 48 boys in the ITF rankings are missing, the most notable of whom are No. 7 Alexander Zverev, the Australian Open boys champion, who has risen to 161 in the ATP rankings after making the semifinals at Hamburg last week, and No. 4 Jaume Munar of Spain. In addition to Kozlov, six other US boys have been accepted into the main draw: Francis Tiafoe, Michael Mmoh, Taylor Fritz, Alex Rybakov, Logan Smith and Henrik Wiersholm. Three girls received entry into the main draw via their Top 350 WTA rankings: Anhelina Kalinina(269) of Ukraine, Francoise Abanda(220) of Canada and Ipek Soylu(342) of Turkey. 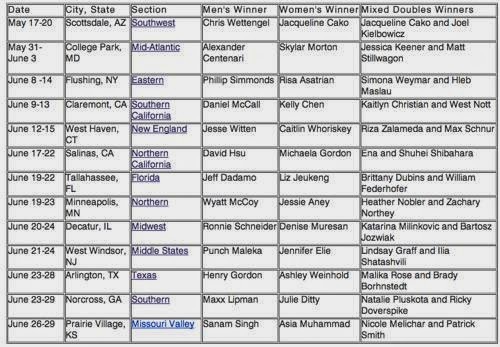 Four of the ITF Top 10 did not enter, including No. 1 Ivana Jorovic of Serbia and French Open girls champion Darya Kasatkina (No. 3) of Russia. Both are committed to play in the Youth Olympic Games in China from August 17-24, which could be a factor, although Kasatkina said she was done with junior tournaments after the French. Rublev is also slated to play in the Youth Olympics, as are Luz and Rybakov, among others (full YOG acceptance list is here), so the travel/time zone changes are not discouraging everyone. CiCi Bellis(2) and Tornado Alicia Black(4) are the top two players on the girls entry list. Other American girls in the main draw are: Sofia Kenin(another YOG participant), Usue Arconada, Dasha Ivanova and Michaela Gordon. Several other US girls are just out of the main draw, including Katrine Steffensen, Kaitlyn McCarthy, Jessica Ho and Raveena Kingsley. As I have for the past ten years, I will be covering the US Open junior tournament onsite again beginning with the final round of qualifying on August 30th. The complete acceptance lists can be found here. The European Championships, which at the 18-and-under level are an ITF Grade B1, are into the round of 16 after today's action. The boys top four seeds--Jaume Munar(ESP), Quentin Halys(FRA), Johan Sebastien Tatlot(FRA) and Roman Safiullin(RUS) are still vying for the title, as are three of the top 4 girls: Wimbledon champion and No. 1 seed Jelena Ostapenko(LAT), No. 3 seed Jil Belen Teichmann(SUI) and No. 4 seed Iryna Shymanovich(BLR). Wimbledon finalist and No. 2 seed Kristina Schmiedlova of Slovakia lost in the second round to Julia Terziyska of Bulgaria 7-5, 3-6, 6-4. It's not the 18-year-old Terziyska's first big upset; back in December she ousted Eddie Herr champion Ostapenko in the third round of the Orange Bowl. Results from the 14s and 16s tournaments can be found at the Tennis Europe site. If you are a fan of Mythbusters on the Discovery Channel (and who isn't? ), tune in Thursday night to see Cal men's tennis assistant Tyler Browne play tennis on the wing of an airplane. Head coach Peter Wright also appears on the show. The segment is scheduled for 9 p.m. Thursday night. 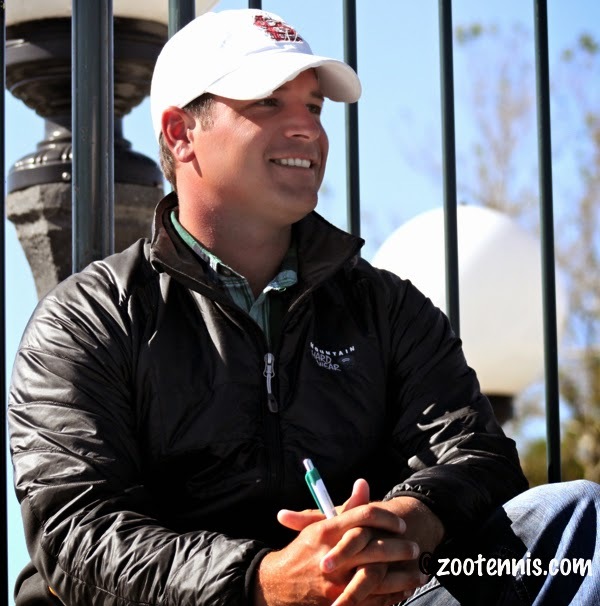 Dustin Taylor, who early in 2013 became the USTA's National Coach for Collegiate Tennis, will be leaving that position to join the Virginia men's program as assistant coach beginning on September 1st. Andres Pedroso, who was Brian Boland's assistant for five (correction: four) years, is returning to South Florida, where he grew up, and will be doing private coaching there. Taylor, who has been with the USTA since 2010, as professional players before accepting the new Collegiate Tennis position, told me his young family and the appeal of less travel led him to consider the possibility of coaching in college. "I truly love what I do at the USTA and I believe in the road that they're going down, with working together and bringing the country together, and I hope I've exemplified that in my time with the USTA," said Taylor in a telephone conversation from his current coaching stop at the Lexington Challenger. "So this isn't a decision to leave the USTA; this was a decision to work with Brian and the University of Virginia. It's about another wonderful opportunity to learn and grow professionally and personally and learn from one of the best and most successful coaches there is at an institution that's as storied and famed athletically and academically as any in the world, really." Taylor said he is advocating the USTA fill his position with Steven Amritraj, the former Duke star now working with young professionals, many of them former collegians, as a National Coach at the USTA's Carson Training Center. But whether the position is filled internally or from the outside, the announcement of Taylor's replacement is unlikely to be made in the next month. Taylor will continue to travel with collegiate players through the US Open's qualifying and first week. The USTA National Collegiate Team, one of the centerpieces of Taylor's plan to enhance college tennis, will be named in mid-August, based on the WTA and ATP rankings of the eligible players. Clay Thompson and Marcos Giron of UCLA and Mitchell Frank of Virginia are three of the six men already on the team, with three spots available. Jamie Loeb and Danielle Collins, who did have wrist surgery and is expected to return to competition at the Landisville $25K in two weeks, are the two women who have earned their place on the team, with four more spots open. It's been over a week since my last update on college coaching changes, so here's what's happened since that July 10th post. The University of Memphis named its new head women's coach, with Hayden Perez, longtime women's assistant at the University of Nebraska, getting the job. Perez left Nebraska in 2013 to take the women's assistant coaching position at Texas Tech. The Pepperdine men's head coaching position has been assumed by assistant Marcelo Ferreira. Sander Koning has been named men's assistant at Indiana. Former player Tanner Stump will return to Mississippi State as the assistant to new coach Matt Roberts. Luc Godin has been hired as women's assistant at the University of Arkansas. The University of Texas women's head coaching job has not yet been filled. Paul Goldstein, who took over the Stanford men's head coaching job last month, received his first blue chip commitment, with Sameer Kumar announcing he will join the Cardinal in 2015. 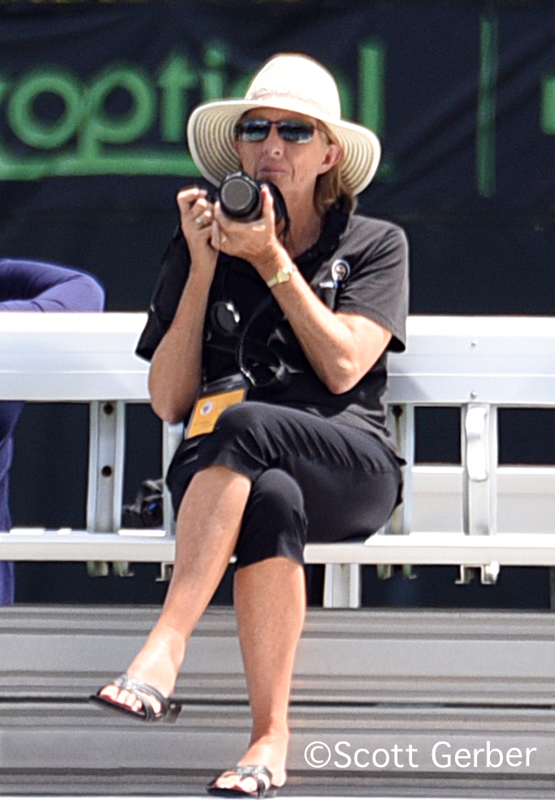 The Tennis Recruiting Network has begun its recap of the USTA Clay Court Championships, with James Hill and Marcia Frost providing the first updates, on the Boys 12s and Girls 12s. The inaugural New Balance High School tournament began today in Cambridge, Mass., with Grant Solomon and Stephanie Schrage the top seeds. So far, the seeding, which I understand was done with the help of the Universal Tennis Rating system, has held up well, with only 4 seeds--2 boys and 2 girls--losing in today's first round of the 64-player draw. The complete draws can be found at the TennisLink site. Scott Gerber of OhioTennisZone.com compiled a review of this week's fields, using the Tennis Recruiting Network as a basis for his analysis. Some of the players have since dropped out, but it provides data to assess the strength of the field. Gerber also recently put together a detailed report on all the participants in June's Midwest Closed. 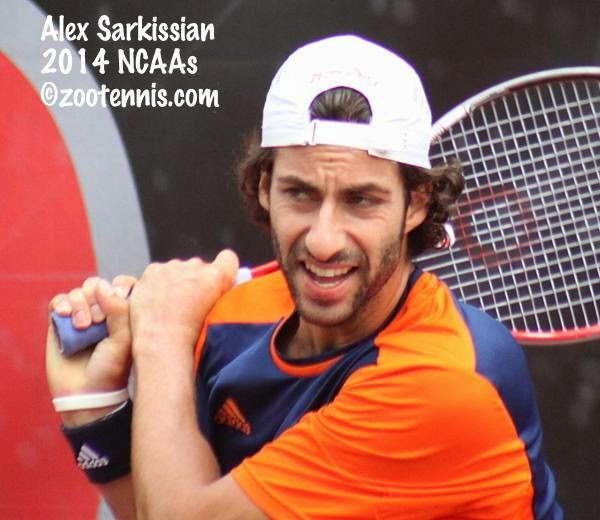 Last night after I posted my review of the Pro Circuit, 2014 NCAA finalist Alex Sarkissian(Pepperdine) won his first Futures title, at a $15,000 tournament in Canada. Sarkissian, the No. 6 seed, defeated top seed Connor Smith(Ohio State) 7-6(3), 6-4. No. 2 seeds Daniel Chu of Canada and Kyle McMorrow(Washington) won the doubles title, beating unseeded Riaan Du Toit and Alejandro Tabilo of Canada 6-2, 5-7 10-7. Had I not been covering the Girls 18s Clays last week, I would have paid much more attention to the impressive results of 17-year-old Alexander Zverev of Germany, the 2013 ITF World Junior Champion and 16-year-old Ana Konjuh of Croatia, who won two junior slams last year. Zverev, as a wild card, reached the semifinals of the ATP 500 in Hamburg and Konjuh reached the semifinals of the WTA International in Instanbul. Teen breakthroughs may have slowed a bit on the women's side, but still exist, while on the men's side, teenagers have had difficulty just getting into the Top 100, let alone going deep in ATP tournaments or slams. Whether Zverev, and 19-year old Nick Kyrgios of Australia are outliers or the start of a trend remains to be seen, but Zverev's week has put him in the company of some impressive players when viewed historically. Ben Rothenberg of the New York Times spoke with both Konjuh and Zverev after their dream weeks for this article. Qualifying for this week's ATP tournament in Atlanta is complete, and due to late withdrawals of Gael Monfils, Richard Gasquet and Radek Stepanek, three lucky losers got into the main draw, as well as four qualifiers. Kevin King(Georgia Tech), who lost to JP Smith(Tennessee) in the final round of qualifying was the only loser in the final qualifying round who did not get into the main draw. Wild cards went to Ryan Harrison, Robby Ginepri and the University of Georgia's Nathan Pasha. Pasha's wild card was originally offered to Georgia's Austin Smith, but his failure to withdraw from the Godfrey Futures this week left him unable to accept the wild card, so it went to teammate Pasha instead. Pasha will play Lucas Lacko of Slovakia in the first round Tuesday night. For more on the wild card situation, see this article from georgiadogs.com. Two-time NCAA champion Nicole Gibbs won the $50,000 Carson Challenger today, defeating Melanie Oudin 6-4, 6-4, collecting the third $50,000 singles title of her career. The 21-year-old Gibbs, who has received a wild card into the US Open the last two years as the NCAA champion, is now in the lead for the wild card the USTA is awarding for the best two performances out of the three $50,000 women's Pro Circuit events. Seeded No. 2 this week, Gibbs lost in the second round last week in Sacramento, to Louisa Chirico, but beat Chirico this week in the semifinals en route to her meeting with No. 4 seed Oudin in the final. The third tournament in the USTA Wild Card Challenge is this week in Lexington, a joint event with the men. For more on Gibbs' win, read this release from Steve Pratt. The men's Wild Card Challenge began this week in Binghamton, but it consists of four events, the last two of which are $100,000 tournaments, which will give them more weight in the final standings. No. 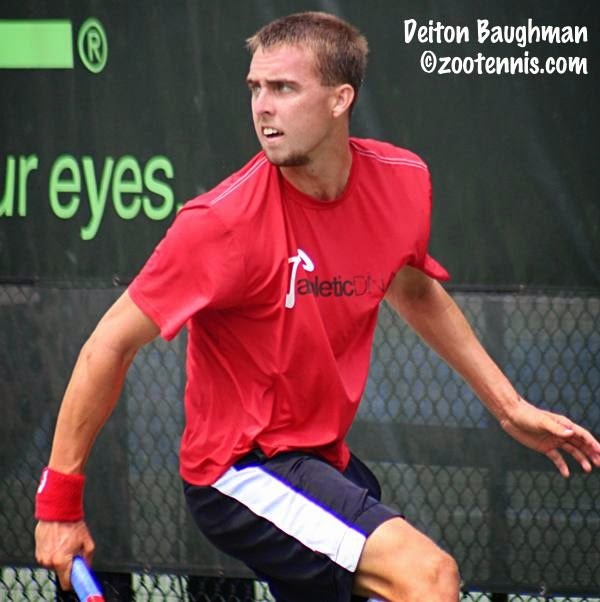 8 seed Wayne Odesnik reached the final of the $50,000 Binghamton Challenger, losing to No. 2 seed Sergiy Stakhovsky 6-4, 7-6(9). Bradley Klahn, who was the top seed, withdrew with a foot injury after reaching the quarterfinals. Denis Kudla also withdrew, tweeting that he's been diagnosed with mononucleosis. Sixteen-year-old Tornado Alicia Black won her second career $10,000 Pro Circuit title today in Evansville. Black, the No. 7 seed, defeated top seed Caitlin Whoriskey(Tennessee) 6-4, 4-6, 6-2 in the final. Natalie Pluskota, Whoriskey's former doubles partner at Tennessee, partnered Florida recruit Brooke Austin for the doubles championship. They defeated Catherine Harrison(UCLA) and 2013 NCAA finalist Mary Weatherholt(Nebraska) 6-4, 3-6. 11-9 in the final. This week's $10,000 event for women is in Austin, Texas. Virginia rising senior Mitchell Frank claimed his first Futures title today at the $10,000 tournament in Tulsa. Frank, who was unseeded, defeated top seed Liam Broady of Great Britain 6-2, 6-1 in the final. As this article from the University of Virginia website points out, Frank beat the No. 1, No. 2 and No. 3 seeds this week, and didn't drop a set. This week's men's Futures tournament is a $10,000 event in Godfrey, Illinois, and is expected to feature Wimbledon boys champion Noah Rubin. The final round of qualifying is Monday, and former Arkansas All-American Blake Strode, who had retired from the tour to attend Harvard Law School, is among those still in contention for a place in the main draw. 2013 NCAA semifinalist Alex Guarachi won her first title today at the $10,000 tournament in Vancouver. The former Crimson Tide star, seeded No. 4, beat top seed Yuka Higuchi of Japan 6-3, 1-6, 7-6(6) in the final. 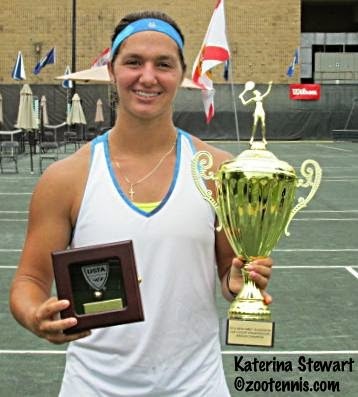 After winning her first two matches at the USTA Girls 18s Clay Courts without losing a game, Katerina Stewart admitted she needed a wakeup call. That came in the third round, when she defeated Emma Davis, a No. 17 seed, 7-6(3), 7-5, the closest match Stewart had all week. The 17-year-old right-hander was wide awake the remainder of the tournament, finishing it with a 6-1, 6-3 victory over Kennedy Shaffer on a cool and overcast Saturday morning at the Racquet Club of Memphis. "I needed that match because I needed a rude awakening," said Stewart, who is on a 34-match winning streak dating back to March. "After two 6-0 6-0s, you're like oh, hey, I'm here. And then you get an opponent like that and you're like whoa, okay, hello. [Davis] played really well, and what's weird is that she plays like an indoor player, but she does well on clay because she has exceptional timing. She was taking my balls on the rise and hitting everything really, really hard. I was panicking, because I hadn't had a tough match. But at 5-all I said, okay let's go, come on, you're used to this, grind it out and I did, thank god. You always need that, even if you don't want it, which I really did not want it, you need it to prepare you for the tougher matches at the end." Those matches never came, as Stewart lost only ten games in her last three matches, taking early leads and never losing focus or motivation. "I had trouble focusing in the first couple of rounds, because I was all over the place mentally, but I really brought it all together," said Stewart, seeded No. 5. "I played really well today also. She's a great player, and she had some really good wins this week, but I'm happy I came through." The first two games of the match went to deuce, but Stewart won them both, and from there took control of the first set, winning it in just over 30 minutes. Shaffer could take comfort in the knowledge that she had trailed 6-1 after a set in her semifinal match with Jessie Aney, but when she was broken at love in the fourth game of the second set, another comeback and a third straight three-set win, looked unlikely. "She's just an incredibly solid player," said Shaffer, a No. 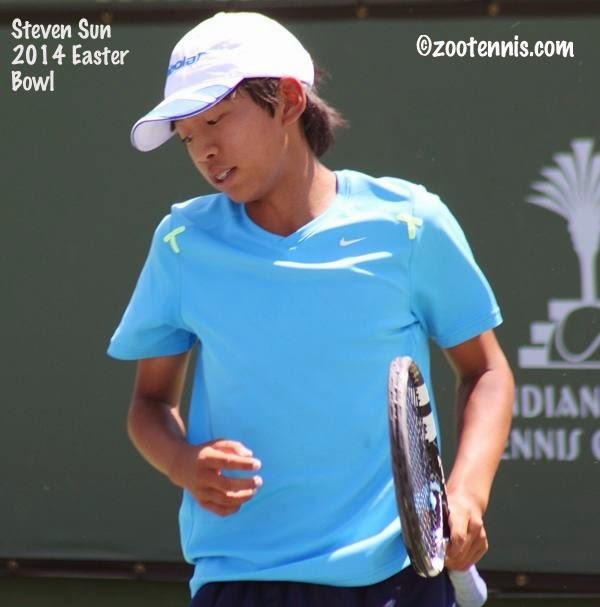 17 seed who had never been beyond the fourth round at a USTA National Level 1 tournament. "I didn't feel like I had much energy left and against a player like her you have to be a hundred percent physically, mentally or she will just wear you down. Corner to corner, heavy balls, pushing you back...she moves well, she has that good slice, she covers the court very well. I just think she's an all around great athlete and she's tough. She's really tough to beat." Although Shaffer didn't get many chances to get back in the match, making errors that she didn't make against Aney in the semifinals, when she did get a 0-30 lead or have a rare break point, Stewart came up with a big serve, usually drawing a weak return that could be efficiently put away. "I was focusing on making a very high percentage of first serves," said Stewart, who trains with her father Caesar at Next Level Tennis Academy in Coral Gables and grew up on the same Har-Tru surface used at the Racquet Club. "She's an aggressive player and I didn't want her to attack my serve. So always on the big points, I wanted to serve into the body, to keep her off balance, and it worked for me today, because I was really focusing well on the serve." "Her serve really kicks up high," said Shaffer, who turned 17 in May. "I felt like if I had taken even just a few more steps in I could have maybe tried to capitalize more off the returns, because that felt like my only chance. As we got farther into a rally, I got more tired, and she could just be out here hours, sliding side to side." Stewart is delighted to have earned a wild card into the US Open Junior Championships with the title, and to have claimed a Clay Court gold ball after losing in the 14s final in 2011 and the 16s final in 2013. But her sights are now set on a wild card into the main draw of the US Open, which goes to the winner of next month's USTA Girls 18s Nationals in San Diego. "It's going to be stacked with really good players," said Stewart, who won the 16s title in San Diego last year. "Everyone wants that wild card--I want that wild card. Even though I'm going to the US Open juniors, that's the big one. I know there are going to be really good players, and I love playing great competition, so that's going to be fun." Shaffer is excited by the prospect of returning to hard courts, her preferred surface, and by the confidence she's gained this week. "That's a lot better for me," said Shaffer, who received the tournament's sportsmanship award . "I think confidence-wise this definitely gets me going. I haven't done too well recently, but I'm coming out of my slump. I'll take this result any day if I'm coming back. It was a good run, and I had a really good time, and I got my first [USTA] ball. That's all I really wanted." In the other two singles matches played on Saturday, No. 4 seed Aney took the bronze ball, defeating No. 8 seed Caroline Lampl 6-2, 6-0. Katherine Fahey, the No. 6 seed, defeated Mia Horvit 6-0, 6-3 in the consolation final. In the new consolation draw for quarterfinalists, No. 1 seed Francesca Di Lorenzo won via walkover from No. 7 seed Kelly Chen. A steady rain Friday sent the remaining matches of the USTA Girls 18s Clay Court Championship indoors, to the four indoor Har-Tru courts at the Tunica National Golf and Tennis Club, about 30 miles south of Memphis. Neither semifinal winner--No. 5 seed Katerina Stewart, who defeated No. 8 seed Caroline Lampl 6-0, 6-1, and No. 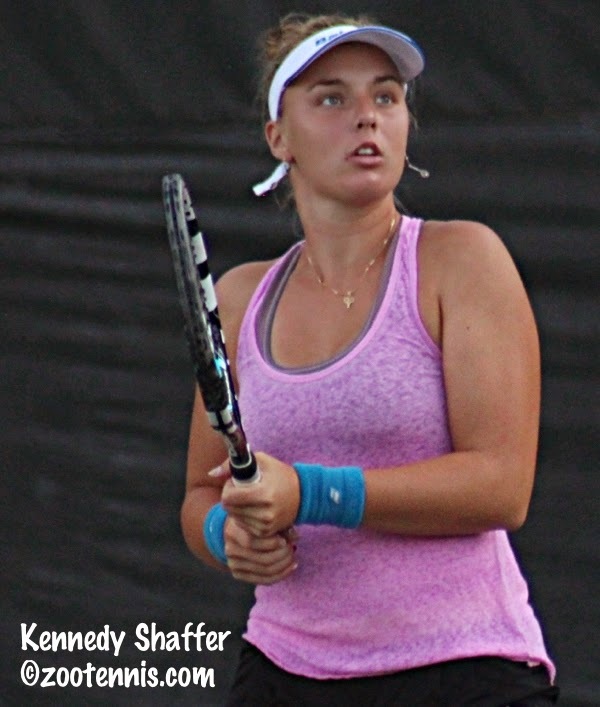 17 seed Kennedy Shaffer, who downed No.4 seed Jessie Aney 1-6, 6-1, 6-2--had any complaints about the change of venue. "I love clay, I could like roll in the clay," said Stewart, who grew up playing on the surface in Miami. "It's so much slower than the other site (the Racquet Club of Memphis), which is surprising, because I thought it was going to be fast. This is my first time playing an indoor clay court, but I really liked it. Clay already gives me enough time, and especially this one. It was way slower than the other one, so it helped me a lot." Stewart, who won the 16s USTA National Hard Court title last year in San Diego, prefers clay, using her topspin and heavy, deep ground strokes to physically wear down her opponents. Calling her match against Lampl her best of the tournament, Stewart said she was focused and "really feeling the ball well." Lampl was more error-prone than she had been in her previous matches, and was unable to find any solution to Stewart's depth and power. Now on a 33-match winning streak which extends back to a $25,000 Pro Circuit event in March, Stewart said so many consecutive wins can add both confidence and pressure. "I actually didn't know how many matches in a row I'd won until you told me, so I haven't thought about it," said Stewart, who said she feels like Novak Djokovic when he had his 42-match winning streak in 2011. "It gives you confidence winning and also that pressure of 'wow, I've won so many matches, I don't want to lose this next one'. Everyone's going out there to beat you, so you don't want to add extra pressure to yourself, so I just take it one point at a time." Unlike Stewart, who has a classic clay court game, Shaffer plays more first-strike tennis, but she too found the Tunica National courts to her liking. "I loved them," said Shaffer, who chalked up her slow start in the opening set to nerves and a lack of experience in big matches. "Everybody keeps saying they're a lot slower, but I thought they were faster. Indoor courts are better for me because I was playing on indoor all my life, so the faster the ball came the more I liked it. I loved these courts, they were really easy to move on, I would take these any day." Shaffer recovered in the second set and began to find her range, but Aney's defense tested her patience, with Shaffer needing to hit three or four extra balls before she could finally get one past the 16-year-old from Minnesota. Even when Shaffer's big shots drew a short ball from Aney and she closed the net to put it away, she was ready to hit another shot. "She's so fit and her game is covering everything, wearing you down every possible way, and that's not me, I'm not that kind of player," said Shaffer, who grew up in Ohio, but trains at the Ivan Lendl Academy in Hilton Head. "So I had to work super hard from the baseline until I found a ball I could move in on. I had short balls that took ten short balls to put away, before I could actually finish the point. But anything that was service line or a little behind it, I was going to move in." At the 10-minute break between sets, Shaffer had an opportunity to consult with her coach Ana Ceretto, who arrived in Memphis in the early hours of the morning Friday. "It means the world to me to have her here watching," Shaffer said. "She said it was going to be on me, if I won or lost. If I attacked, and I made my shots, or I didn't play too smart and let her wear me down physically and mentally." True to her reputation, Aney did not relent even when she was broken for a second time in the third set to give Shaffer a 5-2 lead and an opportunity to serve for the match. Betraying a few nerves, Shaffer made a couple of errors and was facing a 15-40 deficit, but two exquisite points, with 20-to-30 ball rallies that Shaffer finally ended with a forehand winner each time brought it back to deuce. Both girls took a little extra time after each of those two gruelling break points, but Shaffer did not relax or lose her concentration on the next one. Instead, she pounced on a ball she liked early in the rally, hitting a backhand winner to reach match point, then converted it when Aney's mishit backhand hit the ceiling. Shaffer said she wasn't aware that the winner of the Girls 18s Clay Courts receives a wild card into the US Open Junior Championships. "I've always dreamed of that, but I never thought the day would come that I would have a shot at it, to be completely honest," Shaffer said. "This kind of feels like a dream. A Super National, I always wanted to play them when I was younger, wanted to do good, but I never anticipated ever playing for a spot in the US Open juniors. That would mean all the ups and downs, the injuries and time off I've tried to work past have been worth it. I'm improving and I'm enjoying competing, so that's all that matters to me." After the completion of the semifinals and a couple of hours of rest for Stewart, the doubles championship was contested between two No. 9 seeds, with Gabby Andrews and Kenadi Hance defeating Stewart and Mia Horvit 6-3, 7-5. Andrews and Hance had not planned to play together, but when their previously arranged partners pulled out, they paired up at the last minute, when Andrews was checking in prior to the tournament. Although both are from Southern California, they had not played together since the 12s, and it looked as if their tournament was going to end in the semifinals, when they trailed Jacqueline Urbinati and Melissa Lord 6-3, 5-2 before pulling out a 3-6, 7-5, 7-5 victory, which included saving a match point. "Down 2-5, I'm hitting underhand serves," said Andrews, who is experiencing pain in her right shoulder. "She said, if we're going to go out, we're going to go out having fun. And somehow we win that game, and then another, and momentum's going our way. I didn't even care about my arm anymore, my new serve, I don't care what anyone else thinks." Andrews, who won two junior grand slam doubles titles with Taylor Townsend in 2012, started the final serving conventionally, but by the fourth game of the second set she was back to the underhand variety. "I was planning on staying with the traditional serve but Kenadi was smart," said Andrews. "She said, you know your underhand serve is working, why don't you just do that for the rest of the time?" Andrews rarely missed a first serve, and the underhand slice on it made it difficult for Horvit and Stewart to attack it. That didn't mean Andrews and Horvit held serve--there were five consecutive breaks from 3-3 in the third set--but Andrews used her soft hands and exceptional placement while Hance did a lot of the cross court ground stroke work in rallies. "We stayed calm and I think we played smart," said Hance, who like Andrews is 17. "We made them play and we weren't making too many mistakes. We only went for shots when we knew it was the right time." "Patience was key," added Andrews, who closed out the match by holding serve. "We weren't trying to go for shots that weren't there. We were really consistent, didn't go for extreme shots at the wrong time." There are three matches on the schedule for Saturday, all at 10 a.m. In addition to the singles final, the consolation final between Horvit and Katherine Fahey and the third place match between Aney and Lampl will also be contested. Out for most of the spring with a back injury, Kennedy Shaffer lost not only her physical edge but her mental game as well. 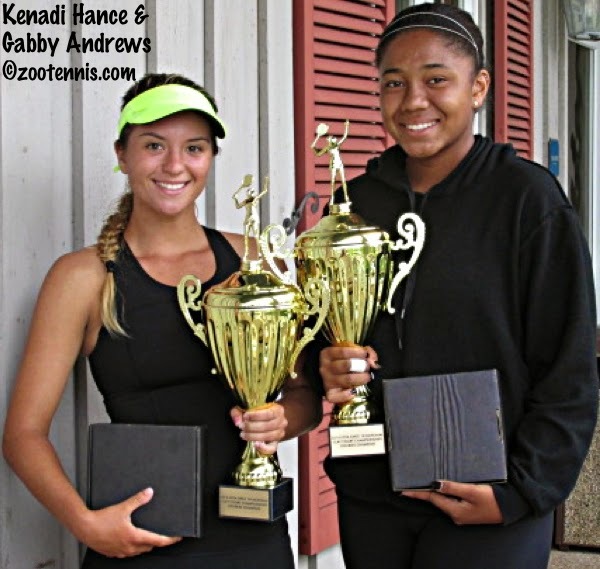 After defeating 2011 champion Gabby Andrews 7-6(4), 5-7, 7-6(4) in the USTA Girls 18s Clay Court Nationals quarterfinals Thursday, the 17-year-old from Ohio can pronounce herself fully fit in both categories. "Tennis is so mental," said Shaffer, who stayed calm throughout the three and a half hour match, which was played in unseasonably cool and cloudy conditions. "And if you're out of practice, physically, that will come. But your mind, that's a whole different story. That takes a lot of extra work. But the better I see myself play, the more my head feels like it's where it needs to be." Shaffer, like Andrews a No. 17 seed, had ample opportunity to crumble after a shaky end to the second set. She served for the match at 5-3, but Andrews hit three return winners in that game, which was not all that remarkable given the countless return winners by both players throughout the match. Shaffer then failed to capitalize on a match point with Andrews serving at 4-5, 30-40. Andrews hit a big forehand near the line and Shaffer, a bit late reacting to it, sent her defensive forehand reply wide. She not only lost that game, but the next two, with Andrews getting a rare love hold at 6-5 to even the match. "You can't afford to be negative against such a good player," Shaffer said of her lack of emotion during that four game stretch. "You don't have time to dwell on what you are doing wrong. You have to keep yourself moving constantly if you want to have a fighting chance." During the 10 minute mandatory rest break between the second and third sets Shaffer received encouragement from her mother Lorri, with her coach Ana Ceretto unable to leave the Ivan Lendl Academy in Hilton Head this week to be with her. "My mom gets really nervous and she just tells me, 'it's okay, it's okay, you're going to be okay. Just do what you're doing, you're doing well,'" Shaffer said. "Reassurance helps." Shaffer led 4-2 in the final set, but she made almost no first serves in the seventh game, which is asking for trouble against Andrews' returns, and was broken. Andrews saved a break point with a drop shot winner in the eighth game to make it 4-all, and both held their next two service games to reach the tiebreaker. After so many entertaining rallies and outright winners hit in the previous games, the deciding tiebreaker proved anticlimactic. Shaffer hit the only two winners of the first six points to take a 5-1 lead at the change of ends, and although Andrews saved two match points, one on a Shaffer double fault and another on a netted backhand by Shaffer after a long rally, she couldn't save the fourth. She missed her first serve, and with Shaffer moving inside the baseline to return the second, Andrews hit her second, which clipped the net and bounced out of the box, putting Shaffer in her first National Level 1 semifinal. "I was so scared," said Shaffer. "But a tiebreaker was better because instead of having to go through a whole game of her serving, it was 2, 2, 2. I was holding my serve most of the time, so if I could put together two good serving points and then two solid returns, I'd have a four point lead, with is massive against someone as good as she is." Shaffer admits that the grinding mentality of clay does not come naturally to her. "I'm not really a patient player," said Shaffer, who recently committed to the University of Georgia for 2015. "You can see it here and there. But I've been working with Ana on heavy topspin and moving my margins in, because if I can hit a heavier ball and more to the corner, less toward the line, I can really open up the court and people can't even get a racquet on that sometimes. So it's less taxing on my body, not hitting out every single time...it's so much more than trying to outhit people. That does nothing for me anymore. I used to think that was the only way I could win, but that's when I lost." Shaffer will play No. 4 seed Jessie Aney in the semifinals. Aney spent several fewer hours on the court than Shaffer, cruising past No. 7 seed Kelly Chen 6-3, 6-0. "It's by far the best match I've played all tournament," said Aney, who has yet to lose more than three games in any set this week. "I think I stepped up a few more times today, hit some big shots, not necessarily coming to the net, but getting on the attack and pushing her around a little bit. I think I did that well, and also, I didn't make any errors and my passing shots were on point, so it was good all around." Aney doesn't think the extra time Shaffer spent on court will have much of an impact on the semifinal, which will be their first meeting. "I think she's in good enough shape that a day's recovery is going to be enough," said Aney, who was last in the singles semifinals of a National Level 1 back in the 12s division. "The adrenaline of the moment pretty much powers people through I think. I think she'll come out strong tomorrow, so I'm ready." The other semifinal will feature No. 8 seed Caroline Lampl against No. 5 seed Katerina Stewart. Stewart, who turned 17 today, defeated top seed Francesca Di Lorenzo 6-2, 6-3 in a well-played quarterfinal. Stewart was much happier with her play against Di Lorenzo than in Wednesday's round of 16. "I had a little hiccup yesterday," said Stewart, who has now won 32 consecutive matches since March. "So today I was just trying to focus on playing well. She's a great player and we both have the same style, so it was whoever took the opportunity first, and whoever could stay in the point longer." Stewart has never even seen Lampl play before, so she will focus on her own game at the beginning of the match. "Usually, every match, I try to do every point tough," said Stewart, who is seeking the US Open junior championships main draw wild card that goes to the winner. "I focus and try my best on every single point, then see what happens and adjust my game plan as I go along." Lampl defeated Gabby Pollner, a No. 17 seed, 6-4, 1-6, 6-2, overcoming the change in game plan Pollner introduced down 4-1 in the opening set. "She hit a lot of spinny balls, hitting it high to my backhand," Lampl said. "Her ball has a lot of kick to it, so it was hard to return. That was how she got back in the first set, but eventually I pulled it out. In the second set, she was playing really well and I had a lot of trouble returning her balls." Lampl said her conversation with her coach Vince Pulupa during the 10 minute break helped her calm down and refocus. "He told me I couldn't really do anything about that second set, she was just playing really well," said Lampl, who recently made a verbal commitment to Vanderbilt. "He told me I only had one set to do this, and I wanted to go to the semis, so I just really focused." Lampl, who turns 17 later this month, reached the semifinals of the 16s Clay Courts two years ago, but she isn't certain it's her best surface. "I'm a hard-hitter, so I really like hard courts as well, but once I get the hang of the clay court style, I really enjoy it," the Virginia resident said. "I'll pull balls out wide sometimes, because my forehand has a lot of spin, so that does help. I do enjoy clay, I just prefer hard courts honestly." Both semifinals are scheduled for 8 a.m. on Friday, with the weather forecast calling for rain most of the day. The doubles semifinals were played Thursday evening, with the finalists taking two distinct paths to the final. Mia Horvit and Stewart, seeded No. 9, defeated No. 3 seeds Lauren Goodman and Di Lorenzo 6-1, 6-2. Meanwhile, on show court 4, a long and tense semifinal ended with Andrews and Kenadi Hance, also a No. 9 seeded team, defeating No. 8 seeds Melissa Lord and Jacqueline Urbinati 3-6, 7-5, 7-5. Andrews, who had her shoulder wrapped with Kinesio tape in her singles match with Shaffer, was unable to hit an overhand serve from the first game of the doubles match, using an underhand motion throughout the two and a half hour contest. Although she struggled on serve early, she began to hit some very tricky low slicing serves as the match wore on. Down a match point at 6-3, 5-2 with Andrews serving, the comeback began, with Hance and Andrews winning five straight games to take the match into a third set. Hance served for the match at 5-4 in the third set, but was unable to hold. Urbinati was broken to give Andrews an opportunity to serve it out and she succeeded, ending her sixth set of tennis on the day with a victory. The time for the doubles final has not been established, but will depend on the completion of Stewart's semifinal in singles. 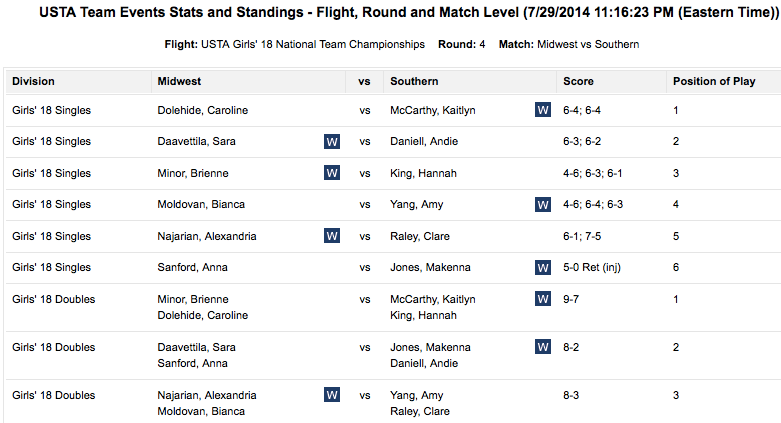 Here are the wild cards for next month's USTA Girls 18 and 16 National Championships in San Diego. For the Kalamazoo wild cards, see this post. Drama was as absent as heat and humidity Wednesday in the fourth round of the USTA Girls 18s Clay Court Championships at the Racquet Club of Memphis. A second consecutive day of low humidity and temperatures barely reaching 80 degrees was the backdrop for eight straight-set wins, with the last unseeded players exiting the main draw. Top seed Francesca Di Lorenzo survived a tough test from Memphis resident Kenya Jones, a No. 17 seed, posting a 6-4, 6-4 victory. Di Lorenzo served for each set at 5-3, but didn't close it either time. In the first set, Jones led 40-0 serving at 4-5, but lost five straight points; in the final game of the match, the 16-year-old was serving at 4-5, 40-15 when the same rash of errors, this time four in a row, led to her demise. Di Lorenzo will play No. 5 seed Katerina Stewart in Thursday's quarterfinals, after Stewart defeated No. 10 seed Brienne Minor 6-3, 6-2. Stewart has now won 31 consecutive junior and pro circuit matches since her loss to Grace Min in March. The other top half quarterfinal features No. 17 seed Gabriella Pollner against No. 8 seed Caroline Lampl. Pollner defeated Melissa Lord, another No. 17 seed, 7-5, 7-6(5) in the day's tightest match, while Lampl downed unseeded Erica Oosterhout 6-2, 6-3. No. 4 seed Jessie Aney and No. 7 seed Kelly Chen will meet for the first time Thursday in one of the bottom half quarterfinals, with neither having come close to losing a set in their four wins this week. Aney defeated Christina Rosca, a No. 17 seed, 6-3, 6-3, and Chen cruised past unseeded Rima Asatrian 6-0, 6-2. Chen, 15, is making her first appearance in Memphis, while Aney made her debut in Memphis last year as a 15-year-old, defeating top seed Spencer Liang in the second round. A year later Aney returns with additional experience but the same affinity for the surface. "I don't play on it a whole lot, but I love it; it's my favorite surface," said the Rochester Minnesota resident, who is a star hockey player on her high school team. "I think I'm a good mover, so I can get to a lot more balls. And I'm pretty comfortable if I get to the net, I can finish the point off, even if they get a few extra balls back, I can finish the point. Also, my slice also sticks a little bit and my heavy ball kicks up more, so yeah, I like clay." 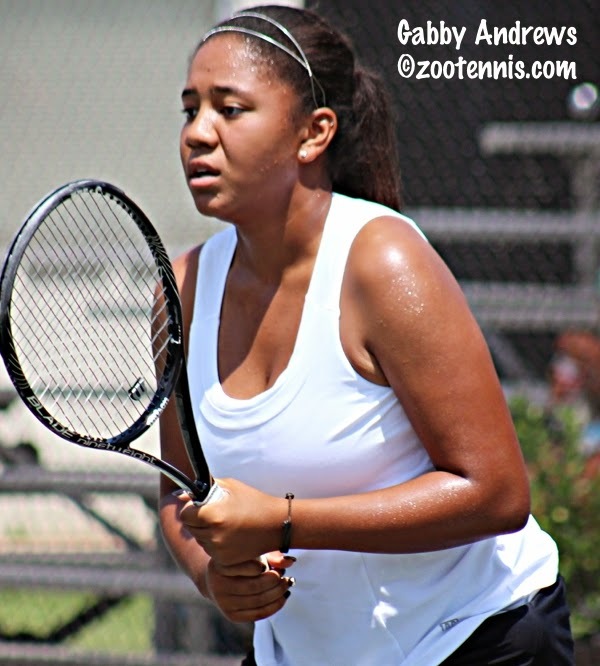 2011 champion Gabby Andrews will face fellow 17 seed Kennedy Shaffer in the fourth quarterfinal Thursday. Andrews looked very much at home on show court 4 against unseeded Maddie Pothoff, taking a 6-2, 6-1 decision. Shaffer, who defeated 15-year-old Dominique Schaefer 6-2, 6-3 on one of the lower three courts, will get her opportunity to be the center of attention on Thursday. Although clay isn't her favorite surface, Shaffer has started to enjoy playing tennis again after a back injury kept her out of competition for several months earlier this year. "I'm kind of coming out of a slump," said Shaffer, who recently made a verbal commitment to the University of Georgia for 2015. "It feels good just to be in matches. When I was off with my back injury, I came back very weakly--I was not winning, I was not doing well, I was not happy on the court. So I took time before Clays to really work hard, make sure this was what I wanted, to put in the time and effort. It feels great to be out here playing good tennis again. I don't care if I win, I don't care if I lose. Obviously you want to win, but it just feels so good to be playing well, competing my hardest. I've missed that so much." Even though she trains at the Ivan Lendl Academy in Hilton Head, where Har-Tru is the prevalent surface, Shaffer is still learning to adapt her game to clay. "I'm feeling really comfortable on clay for the first time in my life," said Shaffer, who is from Ohio. "I'm not really a clay court player. I'm a big hitter, I'm not really the best mover, so clay's a little bit of a struggle for me, but I'm starting to find my way around, work points, hit angles, move in. My slide is better--I can do it now. It's not great, but I can get around the court a little more efficiently." Shaffer is looking forward to her first meeting with Andrews. "I've never played her, but I know she's an amazing player," Shaffer said. "I'm excited to go out and play. I know how good she is, and she's a really nice person. You have to have respect for somebody who has won the title." Due to rain in the forecast for Friday and Saturday, two rounds of doubles were played Wednesday evening, with the semifinals now set. Mia Horvit and Stewart, a No. 9 seeded team, will play No. 3 seeds Di Lorenzo and Lauren Goodman. Andrews and Kenadi Hance, No. 9 seeds, face No. 8 seeds Lord and Jacqueline Urbinati, with both semifinals scheduled for 4 p.m. on Thursday. At the Boys 18s Clay Courts, top seed and defending champion Danny Kerznerman lost to Tommy Paul in the round of 16. For complete draws, see the TennisLink site. Monday night's storms introduced cooler and less humid weather for Tuesday's third round of the USTA Girls 18s Clay Courts, and the change in the weather also produced a change in the fortunes of the top seeds, with No. 2 seed Andie Daniell and No. 3 seed Alexis Nelson exiting in straight sets. Melissa Lord, a No. 17 seed, defeated Nelson 6-4, 6-2 adapting her game from the hard courts she usually plays on in New England. "It's a slower game, so I have to use more spin," said the rising senior from Connecticut. "Since it's a slower game, basically you stay more consistent, spin the ball up when you want and hit more angles. They'll be more effective, drop shots will be more effective." Lord led early, but Nelson, who was not having her best day, managed to get the break she surrendered in the opening game of the match to even the first set at 4. She was immediately broken on a double fault however, and Lord served out the set. Taking a 4-0 lead in the second set, Lord was cruising along but was broken to give one of the breaks back, with Nelson serving at 2-4. Nelson, who will turn 16 next month, was broken at love in the next game, stalling any thoughts of a comeback, and Lord was home free. "That game was very important," said Lord, who hasn't committed to a college yet. "She's a great player, and really tough mentally, so of course there was a chance she could come back. So that game was very vital to the whole match basically." Lord was playing on Court 4, which features ballrunners and a microphone for the chair umpire. But just as with the dozens of college coaches watching the match, which she admitted was "a little intimidating," Lord was able to keep her mind within the lines. "I've never had ball boys or anything, so that was a little different," said Lord, who is coached by Phil Gordon. "Being on that center court was a little nerve racking, but if you just focus on the court, you don't even notice your surroundings." Lord will play Gabriella Pollner, a No. 17 seed, in the round of 16. Pollner defeated No. 16 seed Jaclyn Switkes 2-6, 7-6(5), 6-0. Following Lord onto Court 4 was Gabby Andrews, who won the title back in 2011 as a 14-year-old. Comfortable on Court 4 and with an assist from her grandmother Shirley, who lives in Memphis, Andrews defeated Daniell 6-2, 6-4. Californian Andrews, playing in Memphis for the fifth consecutive year, considers the city her second home, and having family and friends at every match gets her through some tough moments. After four straight breaks in the second set, Andrews held to take a 5-4 lead, and in the final game, Daniell saved four match points before Andrews finally converted the fifth. "She played a couple of great points," Andrews said, referring to Daniell's three big forehands that either were clean winners or forced errors on three match points. "I tried to stay calm but I was kind of pushing near the end. I couldn't really feel my flat shots like I usually do. So I just tried to keep the ball in play. I felt comfortable once we were in the rally. She'd find my weak points and I'd find her weak points. But I think I dictated...actually no, did I dictate most of the points? Because I felt like I was pushing most of the match. Although Andrews said her grandmother doesn't grasp all the intricacies of game, she does provide emotional support. "She reminded me of some bible stories, she has this one story, it's a long one, about her grass. It's a confusing story, I couldn't even explain it," Andrews said. "And she was telling me encouraging stuff, like I've got this, you can do it, I believe in you, stuff like that. It helps." Andrews also said having USTA National Coach Kathy Rinaldi at the tournament brought back some good memories for her. "I saw Kathy here and I remembered all the trips, all that I experienced," said Andrews, who was on the 2010 ITF World Junior Tennis 14-and-under champion team and the 2012 ITF Junior Fed Cup 16-and-under champion team. "I think that experience helped me out today." Andrews will play unseeded Maddie Pothoff in the round of 16 on Wednesday after Pothoff defeated Cassie Mercer, a No. 17 seed, 3-6, 7-6(4), 6-4 in a match played at the Memphis Country Club. Top seed Francesca Di Lorenzo was cruising through her match with Mia Horvit leading 6-1, 3-1 when Horvit raised her game, forcing Di Lorenzo to earn the points she won. Di Lorenzo served for the match twice, at 5-4 and 6-5, failing to get to match point either time, but she did avoid dropping her first set of the tournament, posting a 6-1, 7-6(4) win. "The first set wasn't her best, but the second set she came out like she normally does, which made it a lot tougher," said Di Lorenzo, who turns 17 next week. "She was fighting, and that's what she always does, so I was expecting that." Di Lorenzo, who lost in the 2012 Girls 16s Clay Court finals to Horvit, said she has improved her offense since then. "I build a point better and I'm able to go from defense to offense much more quickly," said the Ohio resident. "I was usually behind the baseline, but I try to step in now, be a little bit more aggressive. In the 16s Clay Courts, I was on defense the whole match, so now I'm working my way into being more comfortable stepping into the ball, coming to net, hitting some volleys, closing out points more." As a left-hander, Di Lorenzo is expected to look fondly on clay, and she does. "I like it. I think it suits my game very well, my high topspin balls can get people off the court," Di Lorenzo said. "I like sliding, I like moving, and it slows the ball down for me, so it suits my game well." In Wednesday's round of 16, Di Lorenzo will play hometown favorite Kenya Jones, a No. 17 seed, in the 8 a.m. match on Court 4. The 16-year-old Jones defeated No. 14 seed Olivia Sneed 6-4, 6-1 to advance. No. 4 seed Jessie Aney avoided the upset bug buzzing around the Racquet Club Tuesday, defeating unseeded Kristen Thoms 6-2, 6-2. No. 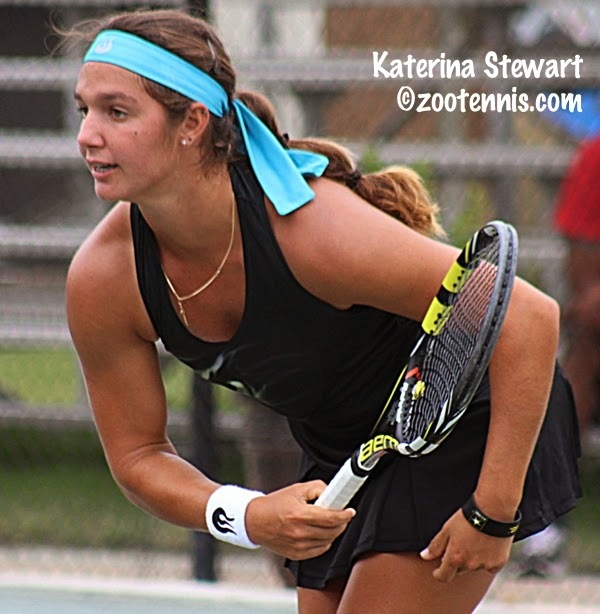 5 seed Katerina Stewart, playing at Memphis Country Club, had her first real test of the tournament, defeating No. 17 seed Emma Davis 7-6(5), 7-5.